Just when we thought the behind-the-scenes featurette was the limit of the exclusive material screened at Star Wars Celebration, Jon Favreau and the team unveiled the real deal — roughly ten minutes of footage from the actual series. The piece kicked off with The Mandalorian (Pedro Pascal) walking into a cantina packed with curious individuals, likely up to no good. The Mandalorian sits down with Carl Weathers’ character, Greef Marda (spelling unconfirmed), who sorts through a bunch of “pucks,” each representing a different bounty. As described during the panel, Grief is running a guild of bounty hunters and he’s looking for someone to go after a very valuable product for a client. Grief explains that the payment will come from someone with deep pockets. He gives The Mandalorian a card and sends him to get further details on the job at another location. From there, The Mandalorian takes to the streets and walks through a market where he passes a Kowakian monkey-lizard (like Salacious Crumb) roasting on a spit. There’s another nearby locked in a cage. He arrives at his destination and before he’s let in, he’s scanned by a TT-8L gatekeeper droid, very reminiscent of the one at Jabba’s Palace in Return of the Jedi. He’s escorted in by a GNK droid and ultimately, a door slides open revealing a room full of Stormtroopers as well as Werner Herzog’s character, someone clearly affiliated with the Empire. This is probably a good time to explain that The Mandalorian is set just after the events of Return of the Jedi. The Empire has been defeated and Emperor Palpatine’s orders to secretly rebuild in the Unknown Regions is underway, so these individuals that we see here representing the Empire are likely those who are deemed unworthy and left behind, which is probably why their uniforms are a bit tattered. That’s where the footage wrapped up, but it serves as quite the set-up! We don’t see a single frame of Pedro Pascal in the flesh, but the way the material is shot ensures your focus is on The Mandalorian and quickly establishes him as a strong anchor to walk you through the chaos. 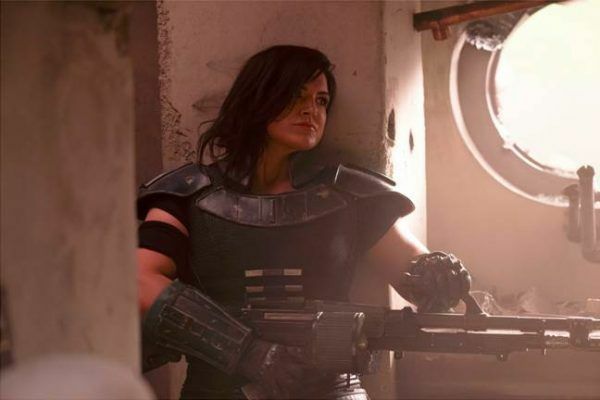 The production value here is through the roof, gritty, visceral, and the scenes also boast an incredible amount of tension, suggesting threats are lurking everywhere and blaster fire could fly at any given moment. The attention to detail is quite striking as well. 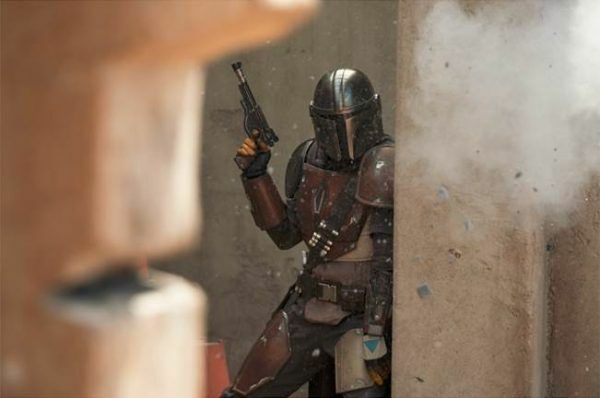 During the panel, Favreau and Filoni noted that The Mandalorian is a show that should satisfy long-time fans but also serve as a great entry point for newcomers as well, and this footage did suggest they might be able to achieve that. You can watch The Mandalorian on Disney+ in the US on day one of launch, November 12th.